1979 by a group of doctors and health professionals as a “grassroots” and “community-based” health organization. “Health is viewed as an entry point for social change and community development." PMRS does not include any financial data, donor information, or sources of funding on its website, reflecting a complete lack of transparency and accountability. PMRS is receiving €421,179 (2016-2019) through the European Union’s East Jerusalem Programme (via Oxfam Novib) for a project to “Protect the rights and improve resilience of vulnerable communities in East Jerusalem.” The total project budget of €2.5 million is being implemented by the Palestinian Agricultural Development Association (PARC), Women’s Centre for Legal Aid and Counseling (WCLAC), and the Palestinian Counselling Centre (PCC)/Jerusalem Coalition. PMRS, WCLAC, and PARC support BDS initiatives through participation in activities and events, signing of petitions and initiatives, and/or membership in BDS platforms. The Swedish government has committed a total of $5.3 million to PMRS for 2016-2020. In 2015, received €109,778.25 from Spain (AECID) for a project with Health Work Committee, an organization that has ties to the Popular Front for the Liberation of Palestine (PFLP). PMRS received $1,127,021 in 2015 and $1,151,620 in 2014 from Sweden (SIDA). SIDA committed $5,096,840 to PMRS from 2012-2015. PMRS received €87,600 in 2016, €45,462 in 2015, and €214,338 in 2014 from Oxfam-Solidarité (Belgium). In 2012, France (AFD) provided Secours populaire français, a French NGO, with €623,117 for a “social project” for “Palestinian youth in East-Jerusalem.” PMRS was the implementing partner of the project. In addition, AFD reported the project “strengthening the resilience of Palestinian youth in East -Jerusalem and its mobilization around citizen and solidarity initiatives ” implemented by these two NGOs (€764,664 by AFD, date not specified), but it is not clear if the money was transferred. President of PMRS, Dr. Mustafa Barghouti, ran as an independent candidate in the Palestinian presidential race in 2005, served as the Palestinian Minister of Information in 2006, and is currently serving as the Secretary-General of the Palestine National Initiative (PNI). 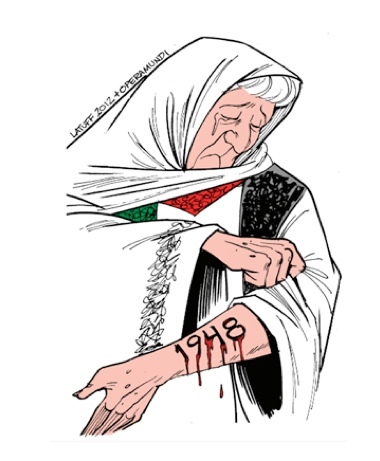 The cartoons featured in the 2015 Factbook include a depiction of a pile of emaciated dead bodies in striped uniforms under the caption “Gaza”; a cartoon of Israeli Prime Minister Benjamin Netanyahu stamping Palestinian babies with the word “terrorist,” as they are transported on a conveyer belt into a smoking oven; and a drawing of an elderly Palestinian woman with a blood-dripping “1948” tattooed on her arm, invoking the numbers that were tattooed on the arms of Jewish prisoners in concentration camps (see Appendix 1 for caricatures below). On June 30, 2017, Barghouti spoke at the UN Committee on the Exercise of the Inalienable Rights of the Palestinian People (CEIRPP) “Forum to Mark Fifty Years of Occupation,” stating that “What we have today is not only occupation. What we have today is a combination of the longest occupation in modern history with a very profound system of apartheid. A much worse apartheid system then what prevailed in South Africa” (emphasis added). He furthered called for individuals to “put every effort you can in contribution to the strengthening of the Boycott Divestment Sanctions. BDS is the most powerful instrument, and it should be used, and it is effective, and that’s why the Israeli government is so crazy and mad about it” (emphasis added). In July 2014, PMRS denied Israel’s obligation to defend its citizens by posting on its Facebook account that “under the false pretense of self-defense, Israel launched yet a new deadly massive attack on Gaza…It is time to finally debunk once and for all the Israeli narrative….No, Palestinians are not the aggressors. No, there is no right to self-defense…There is no such thing as restraint…The war Israel is waging on Gaza right now is not about self-defense” (emphasis added). In December 2013, Ghassan Zaqout and Aed Yagh, who are affiliated with PMRS, contributed to a paper in the Lancet-Palestinian Health Alliance titled “Emergency preparedness and response of the Palestinian health system to an Israeli assault on the Gaza Strip, occupied Palestinian territory, in 2012: a qualitative assessment,” which blames “Israeli violence” entirely, failing to consider the role of terror groups operating within civilian areas in Gaza that necessitate Israel’s self-defense measures. 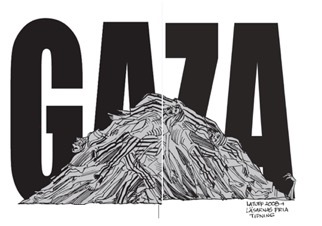 On June 30, 2010, completed the first phase of a project, in collaboration with the Italian political NGO Terre des Hommes, which sought to “evaluate,” “prevent and stop the deterioration of health and psychological conditions of the children in Gaza living in poverty, under the ongoing Israeli siege and repeated attacks by the Israeli military.” The project claims that “52% of the children in Gaza suffer from anemia, and severe deficiency in phosphor, calcium and zinc, while a significant number of children suffer from infections in their respiratory system.” Independent statistical evidence contradicts these claims, and indicates that the other factors, such as nutritional habits, lifestyle, and education are the main causes, and not Israeli policies. See also the 2010 publication of the Palestinian Central Bureau of Statistics (PCBS). Signatory to a 2015 initiative of the BDS National Committee for “the Nakba Day” to “join and build” the BDS movement and to place an embargo on Israel. Collaborates with Grassroots International, Christian Aid, and Medico International on a variety of projects. In the past, PMRS has partnered with World Vision.